Walter Bell (my great, great grandfather) was in born in Whitwell in approximately 1847-8 and was christened in Whitwell on 13/8/1848. He married Mary Edwards (born in Staveley, 1852) on 16/11/1871 in Whitwell. According to his marriage certificate his father was George Bell, labourer, her father was a farmer called George Edwards. Throughout his life he had various trades; Mason’s Labourer (1871), Mason (1881), Pork Butcher (1891) and Coal Loader (according to his death certificate). I’ve found him (I think) on the 1871 census aged 21, lodging with the family of Joseph Gairdham in Whitwell. Also lodging there, was Whitwell born John Bell, aged 60, an agricultural labourer and Dorothy Bell aged 61 from Bolsover. I assume they must be related, but can’t prove it. I know his father was George Bell, so perhaps they are grandparents? According to the 1881 census, Joseph and Dorothy Bell are living on their own at East Parade in Whitwell, whereas Walter is living with his wife and children at Scotland Lane, Whitwell. Sadly Walter Bell’s wife Mary died on 16/7/1899 at Scotland Lane in Whitwell of Bright’s disease of the kidneys and failure of the heart. Shortly after that, Walter Bell himself died in Whitwell on 10/1/1900 of cirrhosis of the liver (there’s discrepancy with his age as his death certificate has his death age at 49). Elizabeth Bell, born 17/3/1877. No further trace of her after the 1881 census where she was living with her parents on Scotland Lane, Whitwell. Walter George, born 1879 approx. He was a coal miner hewer in 1901 where he boarded with the Benjamin and Eleanor Reynolds family at Long Row in Whitwell. Clara Bell, born 29/5/1885. In 1901 16 year Clara was a General Domestic Servant, at the house of a retired hosier named Geo Rutter, on Middlecare Road in Malton, North Yorks. Ann(ie) Bell, born 1873 approx. I think Annie married a coal miner hewer from Whitwell named Henry Taylor. According to the 1901 census, they live with their 5 children (William H, Wilfred, Edmund, Leonard and Mary) along with her recently orphaned younger sister Ada Mary Bell, aged 13, at 2 Sandy Lane in Worksop. Ada Mary Bell, born 6/7/1887. As stated above lived with her sister Annie when her parents died as a child. William Bell (my great grandfather), known as Willie, was born on 24/7/1886. By all accounts Willie must have been quite a character as he was quite short and is reported to have had a ‘hunchback’. When his parents died when he was 13/14, he ended up in Standon Boy’s Home in Eccleshall. 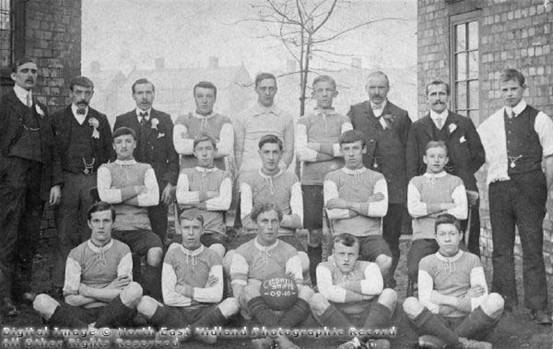 He eventually ended up in Creswell and I have been lucky enough to find a photo of him on the http://www.picturethepast.org.uk/ website as a young lad playing for the Creswell Swifts football team in the 1909-10 season. Whilst in Creswell I believe he was working above ground at the colliery when he married Myra Anne Banton on 26/10/1912 at St Mary Magdalene's Church, Creswell. 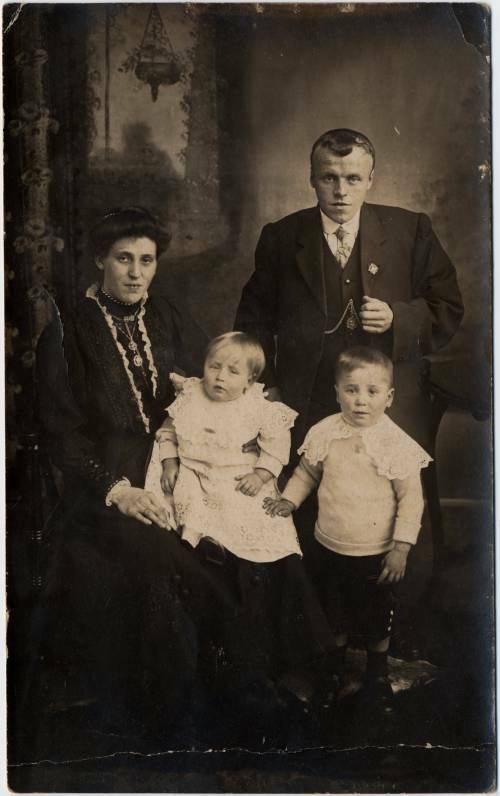 Very little is known about Myra Anne (sometimes spelt Miyra Annie) other than she was born on 29/8/1889 in West Bromwich to her parents John and Mary Banton (nee Churms). The Bantons seem to be a bit of a mystery as I have been unable to find them on any of the 1871-1901 census returns. I do know, however, that John and Mary Banton were living at 26 Duchess Street, Creswell in 1904, when Myra’s sister, Gertie was born. At marriage Willie and Myra lived at 166 Model Village in Creswell, whereby they had 3 children John (Jack) Bell christened Banton born out of wedlock on 27/12/1910, William Bell (my grandfather) born 14/8/1913 and Kathleen Annie Bell born 2/3/1917. Sadly Myra Anne died aged 42, on 7/11/1931, at 39 Bakers Street, Creswell of Exhaustion & Carcinomas of the cervix uteri, leaving Willie a broken man. Little is know of Willie around this time as my grandfather fell out with him to the point that he wasn’t even invited to his wedding to Francis Mona Tunstall of Clowne on 29/2/1936 at Elmton Chapel. Eventually it is believed Willie had a breakdown and there was even a rumour that he was institutionalised (possibly at Mapperley) around 1933-36. Not much further is know until he died of Goceselitis, Tubercolosis of the Spine (Kyplos), Chronic Broncitis & Arterial sererosison on 16/6/1962. He passed away at 1 Peake Terrace in New Basford, as a retired brewery cellarman, closing the door on what must have been a sad and troubled life.